Tasting Notes: Spice, leather and bark with a full silky finish. The Amsterdam Tea Room is delighted to be able to offer you this Liu Bao Pu Erh Guangxi, which really is something special! Grown and harvested during the 1980’s, a full 35 years ago, the leaves have been aged to perfection while carefully stored and monitored. Matured in bamboo baskets in the usual manner of post-oxidizing Pu Erh teas, Royal Pu Erh Guangxi is as unique and distinctive a tea as you can imagine, and is famed and much sought after for its medicinal properties, unmistakable aroma and of course, its venerable age! Royal Pu Erh Guangxi is renowned for its medicinal and curative properties, and is said to energise the body, increase stamina and aid in digestion. It can also help with the breakdown of fat enzymes and help to combat water retention. When steeped in hot water, Royal Pu Erh Guangxi 35 yr produces a rich, intensely earthy flavour with notes of spice, leather and bark and a clear, silky fullness. 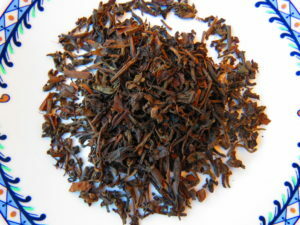 It can be steeped five times or more without bitterness, to unlock the full depth, complexity and age of the leaves. Truly a must-have tea for any genuine connoisseur!